Flounder are present in many estuaries worldwide and NZ is no exception. In NZ very few people try to catch flounder using a rod and reel, preferring instead to target them with a spear, drag or set net. While flounder may not be renowned for their fighting qualities, they are delectable on the plate and definitely worth trying to catch. Flounder are crepuscular – active at twilight – and nocturnal. Mornings up to 10.0 am is the time to find them out in the open. Look for fields of tiny mud-crab holes and the little raindrop sprinkle of dancing shrimp. If the sun is high and bright, concentrate on the weed edges and areas mixed with broken rock or patches of sea grass. Interestingly flounder will also take a spoon baited with a worm and this is a common method of catching them in the UK. The method was pioneered in the 19th Century but it was perfected in the early – middle part of the 20th Century by John Garrad and his is an intriguing story. Garrad was a best known by his pseudonym, Seangler, which he used when writing for the publications Fishing Gazette, The Anglers News and The Angler. He also wrote several books on catching flatfish. 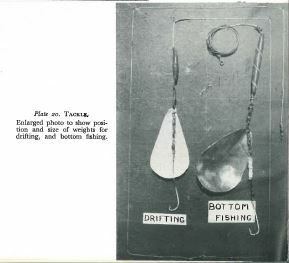 The first was “Flatfish: How to catch them” and the second was “Seangling with a baited spoon”. Garrad was fascinated by lures and spoons in particular. Fortunately for us, he also was very methodical and adopted a scientific approach to his fishing which probably still has no equal. He started experimenting with spoons in the 1920’s and was still at it 30 years later. 30 years of continuous experimentation. That is mind blowing dedication. If anyone ever doubted the reason for keeping a fishing diary then Garrad’s work clearly shows just how useful they can be. Everything he did was done for a purpose and the results were meticulously documented and analysed. 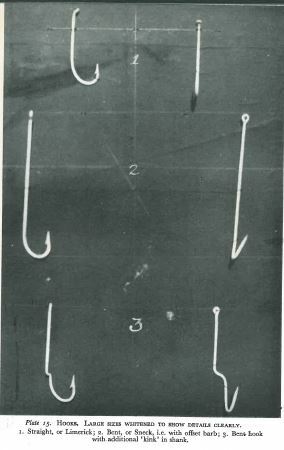 Garrad even carried out his experiments on catching flatfish on baited spoons throughout the Second World War and, in so doing, was able to document the effect of reduced fishing pressure on flatfish size. Spinners – these have flat blades of varying shapes with two extensions or lugs, which are bent in opposite directions, so as to impart a rotary movement to the blade. The blade is mounted on a bar, which either runs through holes at each end, or through a tube welded down the centre. Spinners generally follow the line of pull when towed or retrieved. Bar spoons – includes all spoons that have the blade attached to a bar by its forward end only. Some have more than one blade, but each blade being attached by its forward end only, keeps them within the type. These show the least natural movement during the retrieve, especially in the smaller sizes. Norwich spoons – the blade or spoon acts as the mounting. The swivel to which the line or trace is attached being fitted to a hole at one end, and the hooks to a hole at the other. Show more movement especially those of wide shape and in the large sizes. 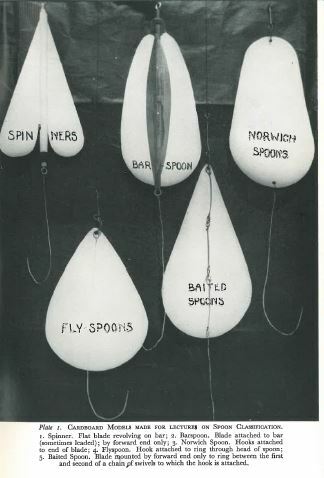 Fly spoons – named from their use with fly rods, as an alternative to flies when salmon or trout spinning. The line swivel, blade and hook all being attached to one split ring which passes through a hole at the head of the spoon. The hook being inside the blade and turning with it. Very little movement in the small sizes. Baited spoons – The spoon is mounted by its forward end only to the ring between the first and second of a chain of swivels. A sufficient number of swivels being used to bring the hook, which is attached to the swivel chain, well clear of the end of the spoon. There must be one or more swivels between the spoon ring and the hook, to prevent the latter being turned with the spoon. The large sizes, on the supple swivel mounting, develop the most movement of all types. Garrad recognised that “spoons have an inherent natural movement, a matter that seems very little known. It is common to all sizes of spoons and was clearly shown in tests with uncounted spoons. When checked by a mounting, in addition to revolving, they follow a zig zag course through the water. In other words, instead of travelling through the water in a straight line as does a spinner, they move in a series of diagonals, up and down, left and right of a straight line. So much so, that. When testing the very large (5” to 6”) spoons, these often broke the surface on the upward diagonal when being trolled approximately 18” below the surface”. This erratic movement is reminiscent of a fleeing baitfish which adds to the allure. He recognised that baited spoons were very effective in targeting fish that “feed on slower moving forms of life, worms, crustaceans and molluscs” and that these fish rarely took an unbaited lure. Garrad proved that these fish were attracted to the lure but would not bite it until the hook was baited and that flounder were particularly susceptible to the baited spoon. He also found that if the lure was baited then flounder would chase it and attack it many times until they either were hooked or stripped every morsel of bait from the hook. Most of Garrad’s experiments were conducted in Portsmouth harbour and involved towing a baited spoon behind a rowboat with the rod being placed over the transom pointing at the lure. Interestingly he only used single hooks on the lures. Over the years he discovered ways to target many species of fish, including eels, garfish, flounder and bass, just by varying how he assembled his rigs and the depth at which he fished. He discovered by serendipity that bending larger spoons at the rear almost at right angles increased flounder catch rates and that for flounder slow spoon revolution was critical. Garrad also found, after years of trial and error with baited spoons of various sizes that the optimum spoon size for flounder was 3 – 4” and that plated spoons worked best. He used to make his own spoons and preferred tablespoons made of lighter material with a rather shallow bowl. He’d cut the handle off as close to the bowl as possible and this gave him a 3 ¼” spoon. Garrad was highly observant and noticed that red painted spoons worked best on bright summer days. One of his most interesting discoveries was that you can establish the tracks flounder will follow as they move up and down estuaries just by dropping corks into the water and watching where the current takes them. “The flounder will most likely be following below, on almost the same course”. Elegant simplicity. Garrad also preferred hooks that were offset for flounder as he worked out that they were more effective at gaining a hookset due to the unusual twisted mouth of the fish. He also was adamant that the whole length of the hook must be behind the spoon and that the optimum distance for the hook bend was 1 ¼ – 1 ½” behind the spoon. Aren’t you amazed by now at the level of detail that Garrad brought to his fishing, based purely of experimentation and sound trial technique? He caught fish casting a baited spoon but it was nowhere near as effective as trolling behind a rowboat. He believed that this was just down to the fact that he could not cast far enough to reach the fish he was catching from a boat. The final thing that Garrad found was that flounder are sight feeders and that they never took a baited spoon after dark, unless it was a bright moonlit night. He also concluded that the spoon flash attracted the fish and that they only noticed the bait when they got close. Mike Ladle is convinced that NZ flounder would take a baited spoon and that shellfish or a scented soft plastic, such as a whirl tail grub, would work just as effectively as a marine worm. If you are thinking of giving baited spoons a crack then try shellfish or a soft plastic, find a spot where an estuarine channel is narrow and you know that there are flounder. Also make sure that the water clarity is excellent. Let me know how you get on. Next Next post: WHAT DETERMINES HOW WELL TROUT FIGHT?